The salt glaze is formed by throwing salt into the kiln during the higher temperature part of the firing process. Sodium from the salt reacts with silica in the clay body to form a glassy coating of sodium silicate, hence salt glazed. or purple by using manganese oxide. At approximately 1660 °F / 780 °C, the salt, (sodium chloride), vaporizes and bonds with the silica in the ceramic body to create a silicate glass. Vibrant blue decorations, achieved by the use of a cobalt oxide slip, are considered a trademark of salt glaze ceramics. Doulton and Watts later became the Royal Doulton Company and keen collectors should look out for good quality early salt glazed stoneware by Royal Doulton. America began producing salt-glazed wares circa 1720 in Philadelphia, Pennsylvania, and Yorktown, Virginia. The use of stoneware articles included storage vessels for a wide range of consumables, such as water, soda, beer, meat, grain, jelly and pickled vegetables. By the 1770s, the production of salt-glazed stoneware production had spread to many centers throughout the United States, most notably Manhattan, New York. 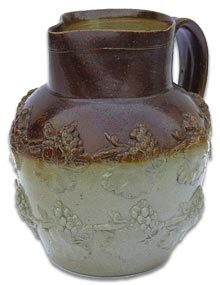 Salt Glazed stoneware became the dominant houseware of the United States of America from 1780 to 1890. By 1820>, stoneware was being produced in virtually every American urban center, with potters from Baltimore, Maryland, in particular raising the craft to its pinnacle. In the last half of the nineteenth century potters in New England and New York state began producing stoneware with elaborate figural designs such as deer, dogs, birds, houses, people, historical scenes and other fanciful motifs including elephants and bathing beauties. Production of stoneware diminished following the introduction of other materials in particular John Landis Masons glass jar. By the turn of the twentieth century, some companies mass-produced stoneware with a white, non-salt glaze (referred to as bristol slip), but this lacked the elaborate decorations common to the earlier, salt-glazed stoneware.